BlueTooth Dragster? | JONAH BRUCKER-COHEN, PH.D. BlueTooth Dragster? 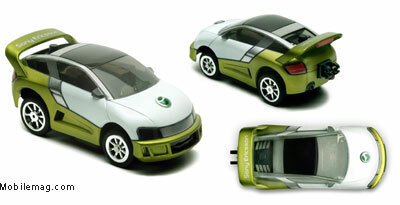 – JONAH BRUCKER-COHEN, PH.D.
New from Sony/Ericsson, the CAR-100, an RC car controlled from a BlueTooth enabled phone. As for the usefullness of this, I’m still trying to figure it out – I guess it’s more of a thing to impress other tech-heads than something really practical. Would be fun to do some mobile Blue-jacking with this car if you could switch it to always being “discoverable” and automate it to find bluetooth devices and send messages to them.